It’s unnatural for loan writing to run ahead of deposit taking for so long. Something weird is going on at Malaysia’s banks. And no, it has nothing to do with the 1MDB money-laundering scandal. The problem is about deposits, or more precisely, a lack of them. As CIMB Group Holdings Bhd. analyst Winson Ng notes, the banking industry’s loans-to-deposit ratio has gone from 76 percent in February 2012 to 90 percent in June. 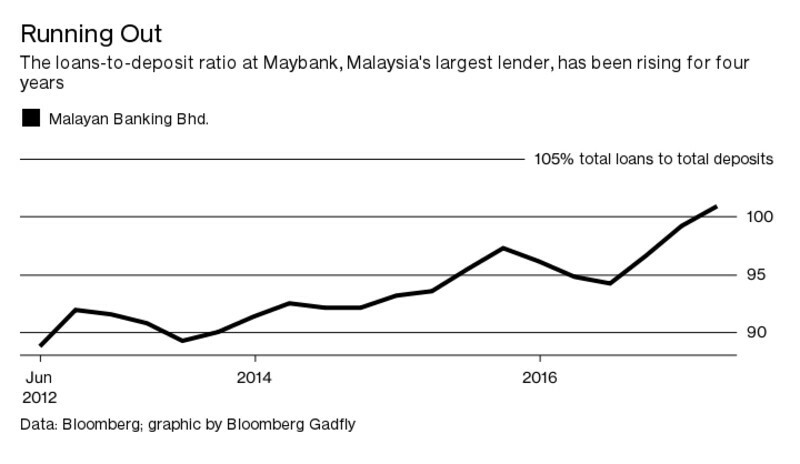 For Malayan Banking Bhd., or Maybank, the ratio is approaching 101 percent, a level last briefly seen in 2006, according to data compiled by Bloomberg. Maybank may be the canary in the coalmine. The largest Malaysian lender controls 26 percent of the $411 billion the country’s publicly traded financial institutions have in deposits. For almost three decades, Maybank’s loans and deposits have both grown at a compounded annual rate of 13 percent. In the past five years, however, deposit growth has slowed to 9 percent, while loans are still expanding at 11 percent. That gap of 2 percentage points is pushing up funding costs. Large Malaysian banks — Maybank, Public Bank Bhd., CIMB and Hong Leong Bank Bhd. — are now earning a net interest spread of less than 2 percent, which puts them in the ranks of emerging Asia’s least profitable lenders. With deposits getting squeezed, listed Malaysian banks and their subsidiaries have raised $6.4 billion from fixed-income markets this year, the most since 2014. Less than half of it is in ringgit, though. The growing reliance on foreign-currency debt is disadvantageous. 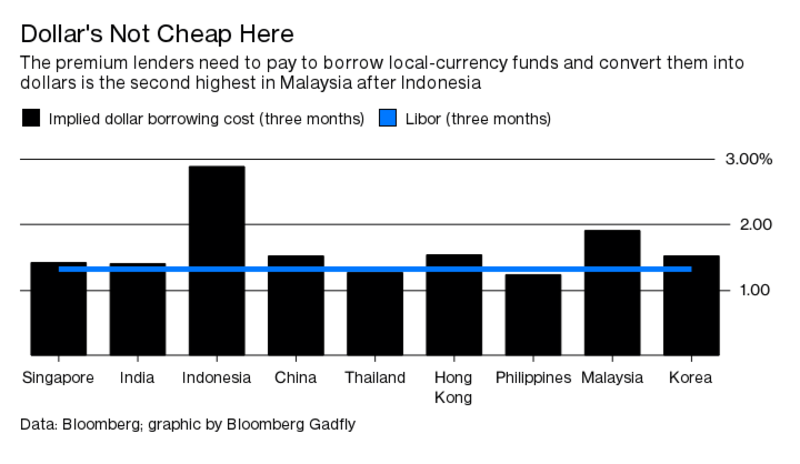 Borrowing three-month money in the local interbank market, and using those funds to buy dollars for the same period, costs Malaysia’s lenders 1.9 percent, an 60-basis-point spread over Libor. In Asia, this premium for short-term dollar funding is stiffer only for Indonesian banks. Unlike their Malaysian peers, however, the Indonesians have plenty of margin headroom. It’s unnatural for loan writing to run ahead of deposit taking for so long. A similar surge in Indian banks’ loans-to-deposit ratios between 2008 and 2014 coincided, initially, with abysmal interest spreads. To boost the latter, lenders threw money at any large company that showed up with a semi-cooked proposal. The cycle ended, predictably, with a blowout in nonperforming assets. 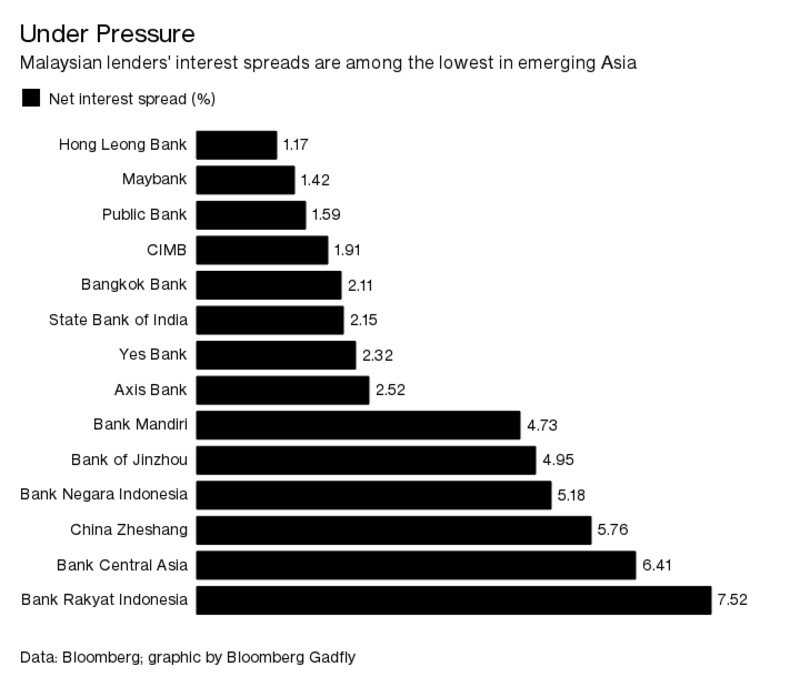 Big Malaysian firms aren’t as reliant on banks for funding, which has helped contain system-wide bad loans at 1.65 percent. However, if banks keep paying more for deposits, they’ll have to accept riskier borrowers. The longer it goes on, the more sinister the deposit crunch may become. Should I be transferring my ringett out and putting it in pounds or dollars? I wouldn’t be keeping too much in RM. I don’t see much upside for the currency as we speak and the housing market is a bubble, that in my opinion is already going down…….it does not get spoken about by agents and people owning property, but it’s pretty obvious that rents are low and no-one can sell units easily. This along with bad economic figures, means that RM will stay low for at least 2 years or more. Political turmoil and a number of other issues will not paint Malaysia as an investment area for offshore money. That means less demand for RM and flat FX. Dollar is strong, so it may not be a great idea to flip there now, compared to RM. Sterling is not a bad idea, but only if you don’t need that cash for a few years in another currency. Brexit is obviously a risk, so if you flip to that, make sure you don’t need to use it offshore for a while!